Posted on Fri, Jan 29, 2010 : 8:10 p.m.
A maple tree too weak to tap, on school property. And of course, the one you tap will have no leaves. Maple syrup isn't exactly a wild food, but it is certainly a foraged product worth indulging in. Local trees formed a few "maplecicles" last week, but the sap has definitively stopped flowing after these cold temperatures. It takes cold nights and warm days to create sap flow, expect those conditions in about a month. And by the way - those "sapcicles" are a tasty treat when you find them! Maple syrup is the first "harvest" each year for Michigan. We produce over 90.000 gallons of syrup each year. Since it takes 40 gallons of sap to make one gallon of syrup, that means a lot of sap is harvested each year. If you have a maple tree, or know someone who does, you can make your own syrup or enjoy the sap as is. It is simple, fun, and almost magical in how simple boiling creates such a taste treasure. Downtown Home and Garden has the taps in stock now. Under $4 each, they are now made of plastic rather than the traditional metal. I take that tap to Stadium Hardware and buy about 4-5 feet of tubing that fits into the spout so that I can set a bucket or bag on the ground, rather than risk spilling, or the need to secure the tap well enough to hold the 8-10 pounds of weight from the collected sap. With a plastic or glass jug, or a plastic bag designed for the task, you are all set for the collection part. A cordless drill is helpful to drill a hole into the tree. Use only healthy, larger trees, at least 12 inches in diameter. Larger trees can accept more than one tap. All maple trees are possible to tap. Sugar maples have the greatest concentration of sugar, but I almost prefer the less sweet other maples. You can also tap box elders. I've read about tapping birch, sycamore, and hickory, but have no personal experience with those trees. This year my foraging friend is experimenting with those varieties so I'll know soon how that is. Drill the hole about 3 feet off the ground. Choose the sunniest or south side of the tree. Drill at a slight angle that allows the sap to flow downward. The hole will be "juicy" and often will start to drip immediately. Sometimes it will take a few minutes. But if the sap is flowing, you will see results right away. Jam the tap in, and attach the hose or bucket. Check the tree once or twice a day, store the sap in the refrigerator until yo are ready to boil it. You can certainly use the sap directly, I make my oatmeal with pure sap. Boiled with the oatmeal it imparts a delicate mapley slightly sweet taste. Very nice. You can also drink it, use it for baking, carbonate it, or anything else you can imagine. I freeze a couple of gallons so that I can use it for morning oatmeal in the winter. To make syrup, boil the sap for many hours until it is greatly reduced. You can measure it, but I go by observation, when a couple gallons is a couple cups and is thicker, darker, and of course sweeter. Since I don't test the syrup for concentration I freeze or can my final product. Of course that is after I keep some to use right away. It is strongly advised that you not boil the syrup indoors. That much water vapor (and sticky sweet vapor at that) can do some real damage or at least make a sticky mess of your woodwork and walls. I'm using a camping stove with a flat shallow pan. I had a conversation with one of our city foresters. I had heard a rumor that city trees were off limits for tapping, and wanted to find out the truth. Because for most people, a maple tree in their lawn extension is the closest maple tree. Alas, the rumor is true. 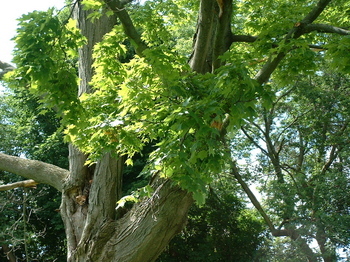 Concern for an already weakened sugar maple population is the primary reason. City maple trees in general have many stresses, and the forestry department would like to protect them from any additional stress introduced by anyone doing it wrong. That includes people putting in too many taps or introducing openings for viruses or pests that might harm the tree. Although a special permit is theoretically available for anyone wanting to do something with city trees, I was told that no permits would be approved for tapping. She also mentioned concern that a passerby might intentionally contaminate buckets left on trees. The forestry department has chosen the most conservative interpretation of what will harm our city maples, but of course they also see the real damage and stress to the trees. You can find much more detailed information online, including from people who have many more years experience than I've had. My dad introduced me to maple sugaring over thirty years ago. then I took a couple decades break. Doing it on my own has just been the last few years. Thanks dad. It will be just a few weeks before the season is upon us. Get the taps while they are available, collect your containers, and of course find your legal tree. Once we have warm days and cold nights, the trees will start to drip. You'll have a couple days or a couple weeks to collect the sap and enjoy it. Be prepared! Tue, Mar 2, 2010 : 8:28 p.m.
Hi Diane - I purchased the plastic taps last year and didn't care for them much. The tubing just didn't hold well. Instead my family and I headed to the hardware store and purchased brass coupling joints and put those into teh tree - worked like a charm as long as we wired the jugs on well or placed them on the ground!